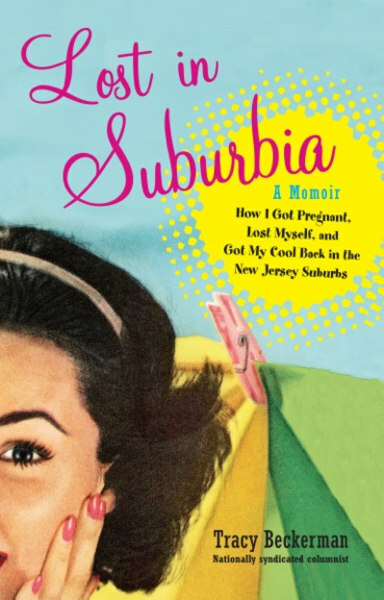 In "Lost in Suburbia," Tracy Beckerman describe her journey into the new experience of parenthood and beyond. Here's an excerpt. Even though I was bone tired and cringed at the thought of going anywhere with a toddler, a baby, and an apnea monitor that was so big it was like toting around a third child, I still recognized that my son needed to get out and play with other kids his age. Something told me he might be a little bitter about having a new baby around and especially one that needed so much attention. My first clue might have been the time I caught him secretly unhooking all the wires from her machine. Then there was the fact that he would smack her in the head whenever I turned away. At this point I realized he probably needed something special of his own, so I signed him up for another group play class, and the four of us (him, me, the baby, and the machine) hit the road for some much-needed social time. The advantage of having a baby attached to a giant machine is it’s a really great conversation starter. Although most of the other moms were polite enough not to ask why our baby had a bunch of wires poking out of her clothes, their kids didn’t have the same inhibitions. “Is your baby a robot?” asked one toddler. “Does she come with batteries?” asked another. “My baby is named Em-lee and this is her apnea monodoor,” boasted my son, suddenly taking proud ownership of his sister and her accessories. We had explained to him in very simple terms what the monitor was and why she needed it, which is probably how he got the idea to disconnect her wires in the first place. Although he was clearly not a fan at first, he was quick to realize that when you have something everyone else wants to have, suddenly that thing becomes much more valuable. Of course, this is only true for the instant in time when the other kids are expressing interest in whatever you have. The second we got home and it was just him and his sister, he was back to whacking her whenever I wasn’t looking. But for now, he got to be the star by association. And suddenly, so was I. “Apnea monitor?” guessed one of the other moms, plunking down next to me on the bench reserved for mommies, younger siblings, and Frankenbabies. The other mom laughed. I liked her immediately. She had brown hair, she wore all black, and she laughed at my jokes. What more could you want in a friend? “She also makes a great cappuccino,” I added. “Yeah. Me, too.” We sat in compatible silence for a moment watching our kids tear around the room like a pack of crazed, sugared-up savages. The box of mini doughnuts and cider they inhaled at the start of the class might have had something to do with it. “I’m Lori,” she said, extending her hand and introducing herself. “Tracy. Nice to meet you.” I shook back. “You know, you don’t sound like a Jersey girl,” I blurted out. She laughed. “Midwest. Just as bad. How about you?” she asked. I shook my head. We chatted easily for several minutes until I saw my son suddenly haul off and shove her daughter hard into a ball pit. I jumped up to reprimand him, forgetting that I was holding my sleeping daughter who was still tethered to the apnea machine on the floor. The machine instantly let out a high- pitched alarm as the wires became disconnected from the baby. She got startled and started to cry, which set off two other babies in the room, as well as the girl in the ball pit. Within fifteen seconds, every kid in the room was crying and every mom was glaring at me for disrupting their hour of semi- freedom. I looked around, frozen in place by the sudden onslaught of mayhem. My new friend got up to rescue her daughter from the depths of the ball pit, turned to me, and smiled. *Reprinted from Lost In Suburbia by Tracy Beckerman by arrangement with Perigee, a member of Penguin Group (USA) Inc., Copyright (c) 2013 by Tracy Beckerman.